Philadelphia and New York: J.B. Lippincott, 1964. 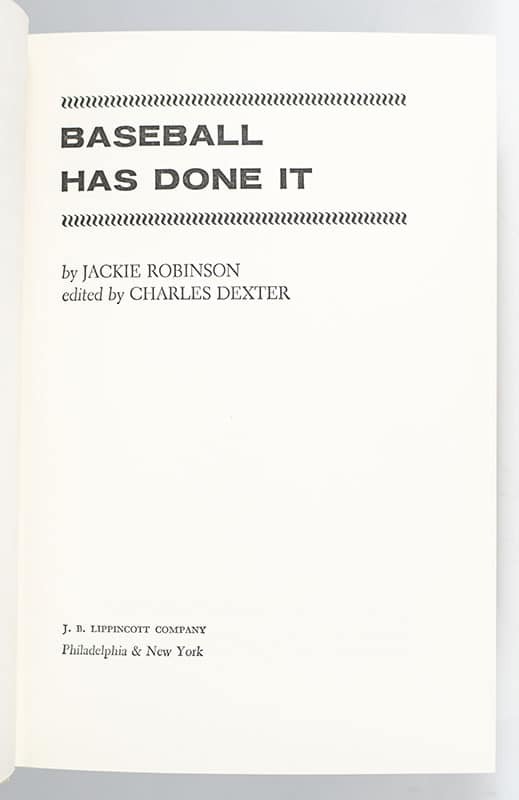 First edition of this work by Jackie Robinson. Octavo, original cloth, illustrated. 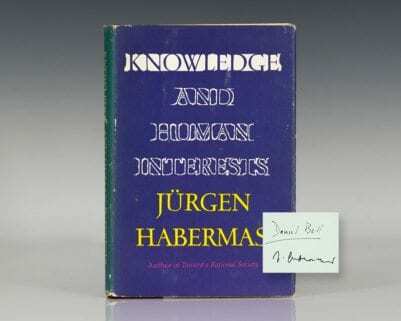 Association copy, lengthily inscribed to his friend David Wallerstein and his wife on the front free endpaper, “To my dear friends the Wallersteins with best wishes. It’s been one of the important events in my career knowing you. I know our friendship will continue always – Jackie Robinson.” David B. Wallerstein was a theater executive and a member of the board of directors at McDonald’s Corp., where he invented the fast food chain’s large size fries. Walt Disney, who regularly flew him to Hollywood to preview his films, said “the two greatest showmen” he ever knew “were Dave Wallerstein and Sam Goldwyn.” Near fine in a near fine dust jacket. Jacket photograph by Byron Goto. 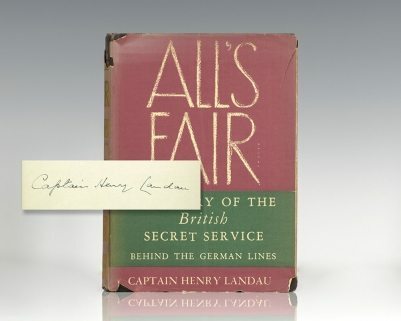 Edited by Charles Dexter. An exceptional association. Baseball Has Done It brings together an extraordinary collection of interviews between a number of famous black players and baseball legend Jackie Robinson. 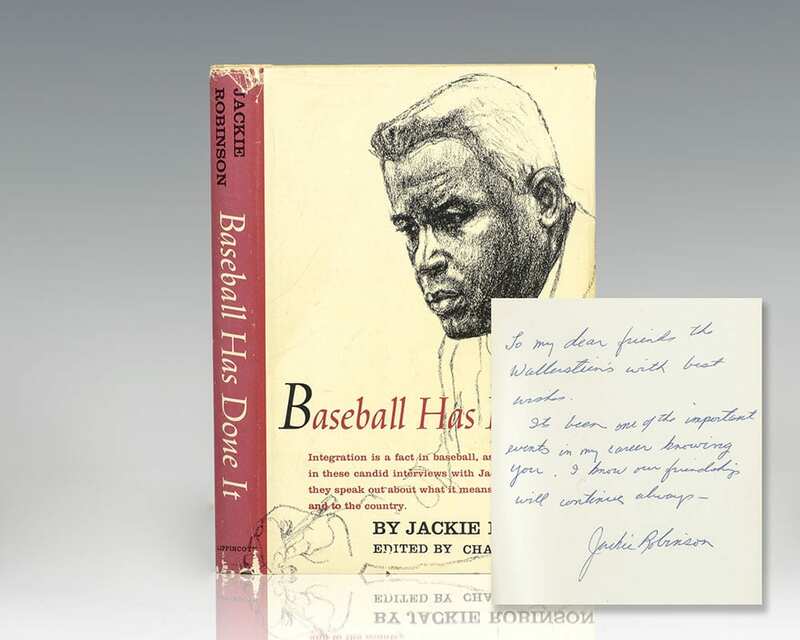 “Professional athletes seldom speak as frankly to interviewers as these men do to Jackie Robinson. Integration is a fact in baseball— here [African-American players] speak out about what it means to them, to baseball, and to the country” (Grobani). Robinson, Jackie; Roy Campanella; Duke Snider; Pee Wee Reese. Black and white photograph of the 1956 Brooklyn Dodgers signed by Jackie Robinson, Pee Wee Reese, Duke Snider, Roy Campanella, Carl Furillo, Dale Mitchell, and five others in ink. The silver gelatin print measures 6.5 inches by 8.5 inches. Matted and framed. The entire piece measures 14.5 inches by 16.5 inches. Rare and desirable signed by these baseball legends.